OG Broad Roots Grow Strong STEMs - The Americans .US! Army Educational Outreach Program aims to engage, inspire and attract the next generation of science, technology, engineering and mathematics talent. The United States’ science, technology, engineering and mathematics (STEM) capabilities are critical to the nation’s innovation, economic competitiveness and national security. Protecting and equipping our most critical asset, the U.S. Soldier, depends on thoughtful solutions that can thrive only if we are constantly ahead of our adversaries in science and technology innovation and manufacturing. Globally, STEM fields will drive the solutions to our most critical challenges in health, safety and the environment. Recent studies illustrate a clear and alarming erosion in the United States’ STEM capabilities, evident in both the skills gap plaguing our major industries and our students’ lagging achievement in mathematics and science compared with peers worldwide. Since the National Academies’ seminal report, “Rising Above the Gathering Storm: Energizing and Employing America for a Brighter Economic Future,” brought this issue to the forefront a decade ago, partners across just about every sector have answered the call for a coordinated federal effort to reposition the U.S. as a leader in STEM. To date, this coordinated federal effort has had mixed results in improving STEM throughout the school-to-career pipeline. Thanks to strong bipartisan support, STEM education has become a highly visible and widely championed issue in the business, education and STEM communities. However, U.S. students still rank only 35th in mathematics and 18th in science in the most recent Program for International Student Assessment, and economic data show that roughly 1 million additional highly qualified STEM graduates will be needed over the next decade. Though student proficiency is beginning to increase in these subjects, the U.S. has a long way to go before its students have the knowledge and skills they’ll need to succeed in tomorrow’s jobs. To address the challenge of attracting students to STEM careers in support of both DOD and the nation, the Army has curated a portfolio of STEM-rich programs for students and teachers that engage and inspire the next generation of STEM talent and provide exposure to DOD STEM careers. The Army Educational Outreach Program (AEOP) provides students and teachers from elementary school through college access to collaborative, high-quality STEM programs that encourage a STEM-literate citizenry, STEM-savvy educators and future STEM leaders nationwide. AEOP engages scientists and engineers from across the network of Army laboratories as mentors and guides, bringing young people directly into our laboratories and research assets for hands-on STEM challenges with real-world applications. The Army strives to build a diverse, well-prepared, STEM-literate workforce in support of the defense sector and the broader national STEM challenge. By leveraging the Army’s strengths and leaning on the strengths of partners, the Army is addressing the STEM crisis on multiple fronts, with promising results. The Army provides strategic direction and oversight for AEOP. The program is executed through a cooperative agreement managed by Battelle, a global research and development organization based in Columbus, Ohio, that also coordinates STEMx, a platform to share and disseminate STEM educational tools across the country. 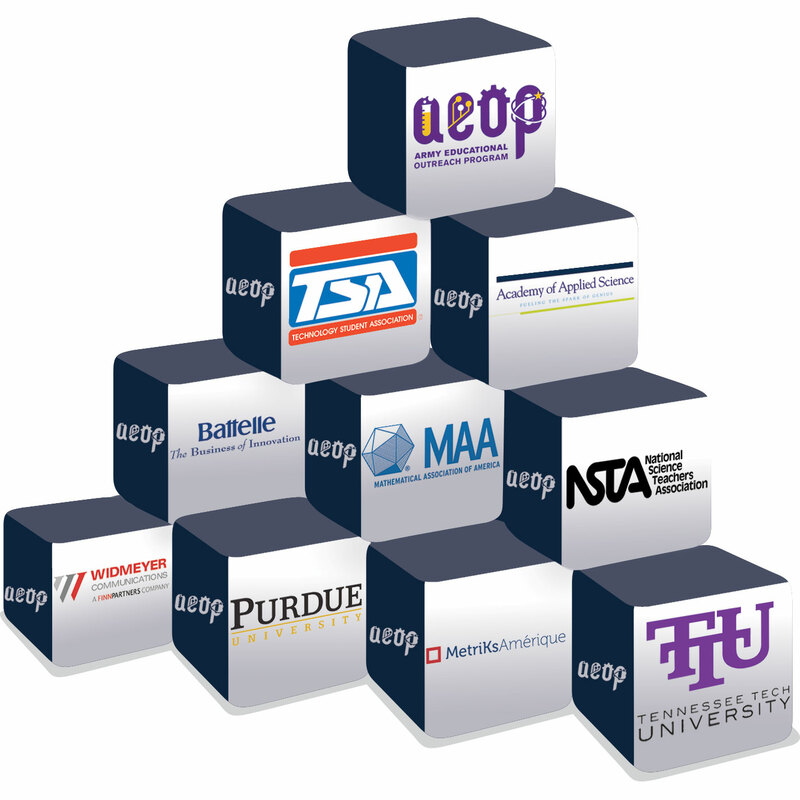 Additional partners for the cooperative agreement include the Purdue University College of Education; Widmeyer Communications, a Finn Partners Company; MetriKs Amérique LLC; Tennessee Technological University’s Millard Oakley STEM Center; the National Science Teachers Association (NSTA); the Technology Student Association (TSA); the Academy of Applied Science; the Mathematical Association of America; and the National Inventors Hall of Fame. Each partner plays an important role, from recruiting volunteers to supporting communications and administering programs. AEOP partners provide the STEM education component to maximize the benefits and use of Army research assets. Additionally, they help reach a much broader network of STEM educators through networks such as STEMx and through NSTA and TSA, with a combined active membership of over 300,000 students, educators and business professionals. AEOP is investigating new and innovative ways to forge mutually beneficial relationships with organizations and technical associations that have similar STEM goals, specifically serving students from underserved populations and military dependents. In collaboration with our strategic STEM partners, AEOP is empowered to leverage their partners’ robust and established STEM networks, build on and synergize with existing relationships and promote its portfolio of enriching STEM opportunities for educators and students. The intent of the AEOP Strategic Outreach Initiatives, started in April 2016, is to broaden student participation in the AEOP portfolio to better reflect the nation’s demographics. AEOP selected partners specifically for their leadership in STEM learning and outreach to African-American, Hispanic, female and military-connected students. Current partners include the Society of Women Engineers, the Tiger Woods Foundation, Harmony Public Schools, DC STEM Network, Carnegie Academy for Science Education and the EduCare Foundation, among many others. Through these strategic partners, AEOP is able to broaden its network far beyond the Army laboratories and our university partners. The AEOP strategy has also significantly improved the Army’s ability to capture measures of success, to identify STEM program gaps, to maximize resources, and to create, train and defend a sustainable STEM infrastructure. These investments center on a measurable and defensible value stream that affects an expanding workforce, including Americans in rural and urban settings, as well as other underrepresented groups in STEM fields. The program tracks improvements in these areas and analyzes the effectiveness of each AEOP STEM effort. Most important of all, the AEOP programs work. Students have reported a deeper interest in STEM after completing just one of the AEOP enrichment programs, competitions or apprenticeships. Program impact has been captured through survey data. Furthermore, AEOP alumni attest to how the AEOP experience dramatically improved their understanding of STEM careers in DOD and beyond and set them on a path to pursuing a STEM-related career. A recent initiative evaluated the impact of AEOP activities on the 21st Century Skills Framework, representing the skills and knowledge students need to succeed in work, life and citizenship. Preliminary results suggest a statistically significant improvement in skills such as creativity and innovation, critical thinking and problem-solving, as well as productivity, accountability, leadership and responsibility. Teachers who participate in AEOP programs are better able to engage students in hands-on STEM learning in the classroom. Results also indicate that even Army civilian mentors gain valuable skills and insight through their work to inspire a new generation of STEM talent. Across the country, the programs are showing significant progress. In the 2016-17 academic year, AEOP received 39,715 online applications and placed 32,792 students in programs, representing a 15 percent increase in both applications and participants from 2012. Additionally, 2,568 teachers had authentic laboratory experiences—a threefold increase in four years. Nearly 2,000 Army scientists and engineers participated in the programs, and students and teachers worked in 22 participating laboratories and 118 participating universities across the country. This success is a helpful case study for other programs and stakeholders looking to make a real impact on students from all communities. It is an exciting time in the U.S. for STEM, and the momentum continues to grow. However, this momentum will not spur dramatic improvements in students’ preparedness for tomorrow’s STEM-driven careers if stakeholders fail to partner and work together toward measurable outcomes. We also won’t get far if African-American, Hispanic, female and military-connected students continue to lack access to the quality STEM exploration and courses of study they need to thrive. The STEM workforce will continue to grow, not just in importance, but also in size and complexity. U.S. competitiveness—and our children’s future—is at stake. Together, we must ensure the next landmark STEM report tells a different, triumphant story. For more information, go to www.usaeop.com. DR. MATT WILLIS is the director for laboratory management in the Office of the Deputy Assistant Secretary of the Army for Research and Technology. As such, he shapes policies that impact the workforce, infrastructure, technology transfer and STEM educational outreach posture at the Army science and technology research laboratories. He holds a Ph.D. and an M.S. in chemical engineering from the University of Illinois at Urbana-Champaign and a B.S. in chemical engineering from Cornell University. He is Level II certified in S&T management and is a member of the Army Acquisition Corps.